Made With Love make lovely handmade luxury cards for all occasions. Father’s Day will be here soon and of course there are lots of fun and original cards to choose from for this special day. Made With Love is a shop that has lots of designs available and there’s something for every type of dad. The cards are all unique and quirky! Most of the cards from this shop can be personalised by adding a message to the front and by changing the colours to suit the recipient. The cards are handmade to order and will be dispatched the next day for orders placed before 4pm. 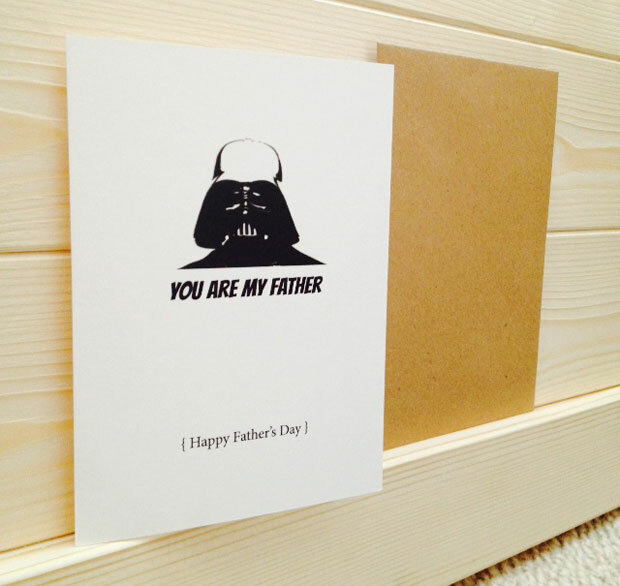 The card that is my favourite and that I chose is this “You Are My Father” card with an obvious Star Wars theme. I’m not into Star Wars and neither is my husband who will receive this card from our daughter but I love the card for its simplicity and humour. The message is funny and factual! It’s quite a small and minimalistic card, perfect for stylish dads or ones that love films. My card was delivered in a sturdy cardboard envelope and was wrapped in protective paper. The quality is very nice. Some of my other favourites include these two above and below that I find very sweet and cute! I’ve got a special discount code for my readers that takes 30% off your whole order. The code expires on Friday 19th June. You can still order for Father’s Day delivery until midday on this day as Saturday delivery is available. Simply shop as normal and then add the code to the shopping basket to receive your discount. See the code below. I was sent a Father’s Day card from Made With Love as a thank you for this post. All thoughts and opinions are my own.